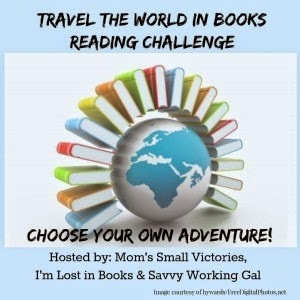 Travel the World in Books is a reading challenge cooked up by the lovely ladies at Mom's Small Victories, I'm Lost in Books, and Savvy Working Girl. It aims to be a "no-stress, no-worries, kind of challenge that helps you expand your reading and cultural horizons" where you can set your own goals. Interested? Check out the Sign Up Post to find out more! I'm horrible at reading challenges - they usually stress me out because I'm such a spontaneous reader-reviewer that I just cave under pressure. So when I saw this reading challenge was a "choose your own adventure" type of thing where I could set my own parameters, I decided to join in. I have also been wanting to create a Google Map with all my existing reads and I think this project will get me jumpstarted! 1. Length of time: Let's put 5 years. Although honestly I think this will be a perpetual challenge for me. 2. How many countries: As many as humanly possible. 3. How I'll track the countries visited in books: Google Maps here I come! I'll also track in good ol' Goodreads and tag in my blog. My right sidebar now has a dropdown menu "Travel the World in Books" ... and ta-DAH: My Guiltless Reading Around the World Book Map has been created! Please check it out! 4. Book list or genre: I'm leaving this wide open, though I aim to read a mix of fiction and non-fiction. Well, that was painless! Let's see how this goes! Sweet! Glad your sign up was easy and painless. I am like you and wasily distracted by good books. Though I have a TBR a mile long, I yend to just pick up whatever I can get right away. Are you on pinterest too? You can find me at http://pinterest.com/momsvictories. I started a group board where we can share our reviews and pin them to a group map. Thanks for cooking this up Tanya! I'm on a bit of a roll here. Thanks for adding me to the Pinterest group through I still am trying to figure out how to incorporate the map part of the board when pinning. Also, my Google Map is up. I got a geeky bug over the past two days and I'm pretty happy with it. It's a work in progress, but definitely fun. And I am horrible at geography so it looks like this actually will help me some.